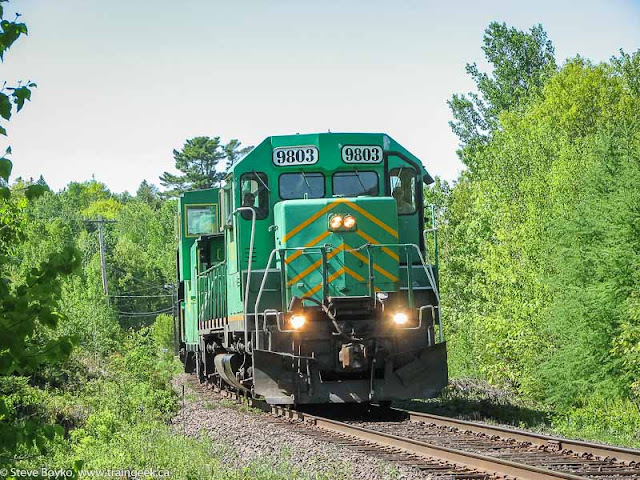 Just a drive-by today, with NBEC 6900 ready to lead CFMG 6902 and NBEC 1818 out of Miramichi at 15:30. CFMG 6907 was the power in the yard for 402 to Moncton. There was some MOW equipment beside it. CPR Track Evaluation Train on the way? I heard the CP TEC (track evaluation) train was on the Sherbrooke subdivision in Quebec yesterday morning. Hopefully we'll see it come to New Brunswick shortly. This year it has CP 8218, a box car and stainless cars 64 and 65, totally different than last year's train. Here's a great shot by Frank Jolin of the train crossing the Richelieu River on June 26 (two days ago). I'm told VIA 15 hit an ATV at Beresford, just north of Bathurst, this evening. Here is a photo of the Ocean stopped at Beresford at 8:04 PM. This photo was taken from the overpass at the highway 11 exit. I'm told the ATV riders, a father and son, were killed. Nothing on the CBC web site yet. Gary Lee has posted some videos of the local switcher (currently NBSR 9801) doing its thing in McAdam. Here 9801 is running light up to the crew shack. 9801 pulls a set of gypsum cars up to the station. 9801 and the caboose, 434919, roll by the station. Thanks, Gary! Can we see some of the big freight train too? 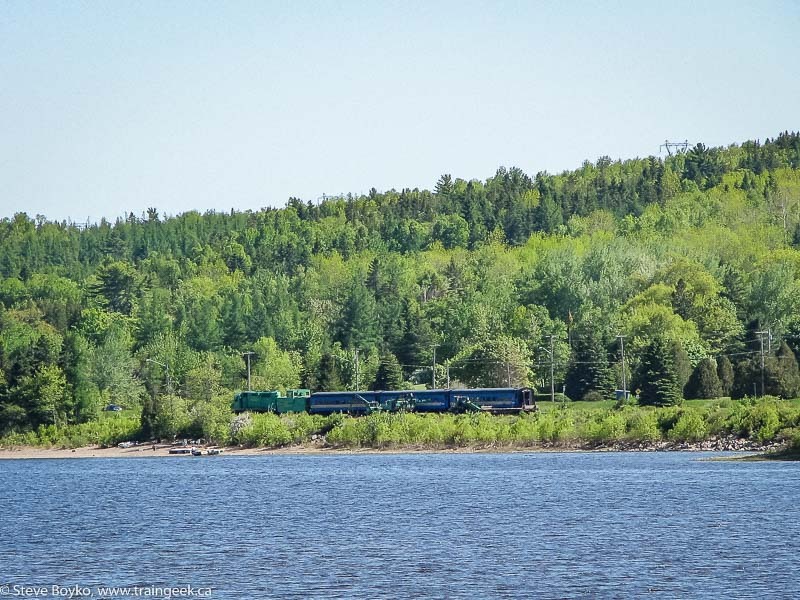 Noting the rumours about the cessation of some freight service on the Windsor & Hantsport, Ivan Smith has created a page documenting what might be one of the last freight runs on the W&H. Check it out! I was in Moncton today on my way to the Open House at the New Brunswick Railway Museum, and I happened to see a few trains on the way. CN 6021 was zipping around in Gordon Yard at about 11:40 this morning. CN 4727 and 4729 were resting. I saw what looked like 4709 and 4719 behind them with a 4xxx GP9. course the West End sign and signals are down. a bit and let 15 into the station track, then back up to let 15 out. Apparently they were a bit too long for the 8900? foot siding there. I'm off to the open house today at the New Brunswick Railway Museum. The site will be open from 10:00 a.m. to 6:00 p.m. on Saturday. This will be a casual day, and a great chance to meet and socialize with your rail enthusiast buddies and to hear all the stories about the winter's happenings. It will also be a chance for visitors to wander around the site, and refresh their memories of some of our equipment and artefacts. For others it will be a chance to note the changes since their last visit to our site. There will be a BBQ from 11:00 to serve up free hot dogs and soft drinks. At about 1:00 PM we will unveil a plaque to honour the CRHA Members, Supporters and Volunteers, who have left this world. When I arrived in Saint John on Tuesday, I heard NBSR 2317 talking with the RTC. 2317 was heading up the transfer freight trying to get over to Island Yard. There was some MOW work going on near the Reversing Falls bridge that they had to wait for, then they got permission to proceed. Here 2317 and 9803 are going over the bridge at 10:00 with four boxcars and a bunch of doublestack container flats. From the chatter on the radio it sounded like they would have to wait for another maintainer to finish putting some ballast on the tracks before they could proceed to Island Yard. Speaking of Island Yard, CN 2573, 5559 and 5621 were parked in the yard while CN 7079 and NBSR 3701 did some shunting. I was fortunate to catch a glimpse of the elusive Courtenay Bay potash switcher. This was literally a stop the car, jump out and take the picture shot, before the switcher disappeared behind a string of cars. That switcher is hard to photograph! Radio chatter indicated that NB Southern would be sending a ballast train out at 3 PM. Later in the day, I saw the CN 305 power over at the Courtenay Bay potash terminal. The smokestacks in the background are for the Courtenay Bay power plant, with the short one being the stack for the Bayside gas turbine. I thought I would try an overhead shot from the Courtenay Bay causeway, so I parked nearby and walked over. I do not recommend this location, as it is not safe. There is no walkway and cars are zipping by at a good clip. Since I was there, I took the shot, but I will not return there again. This looks dangerous but it really isn't. There was some chatter about when 305 could return to Island Yard. Apparently 7079 had some more switching to do, so 305 elected to go to Cain's Corner so as to clear the potash terminal and let them do some switching. 305 took 45 cars over and stopped just short of the crossing. One crewman walked over to the signal box and made the gates go back up, which is when I got this shot as I drove through the crossing. Over on the west side, NBSR 3703 was doing some shunting at the west end of the yard. To my surprise, they had CN caboose 79624 with them. I had seen this caboose deep in the yard before, but I never had a chance to take a photo until now. I assume the caboose was there to provide additional braking power for 3703. It's in pretty good shape, considering. As I left Saint John, I heard someone say they were cutting one engine out of a consist to use as the ballast train's power. They were taking 10 cars out (+1 = a caboose?) and wouldn't be on the road until at least 15:30, which was too late for me. The eastbound freight was just getting into McAdam at 16:00. Here's a little clip of 3703 I took with my Canon. Do You Think Railpictures Would Like This Shot? ...or is there just a bit too much foreground clutter? A real post to come, about Saint John yesterday. 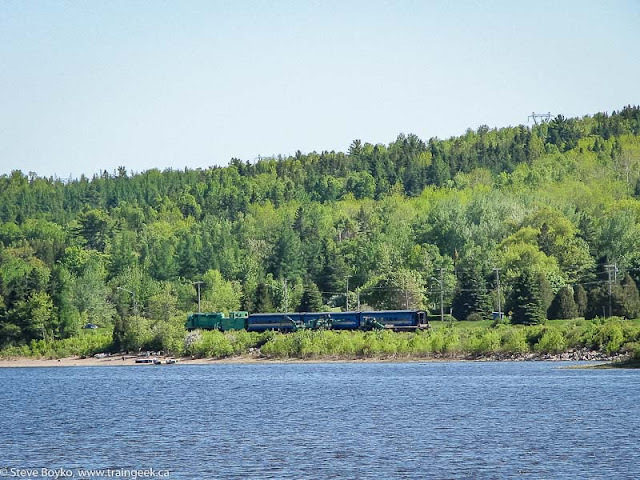 Danny McCracken alerted the RailsNB group that NB Southern is running an excursion on July 1 from McAdam to Harvey and back. Tickets are $15, or $10 for those under 12. Tickets go on sale at noon Friday June 22 at the McAdam Village Office and they are NOT doing phone sales. I didn't see them last year but Peter Gough did. Here's a few images that Kevin Gaudet sent me from Kevin's visit to Saint John in May. The first two show CN 7000 and NBSR 2610 at the west end of the ex-CN yard in Saint John. CN 7010 also made an appearance that day, at the same location. I embedded a few of Kevin's videos from that day a while ago. I saw the CP TEC train on June 20 last year. It was a totally different consist, though: CP 8217, CP 68, CP 424993, and CP 63. I thought I'd share a few more statistics on my web site, just in case you needed something to put you to sleep. Web traffic has been pretty constant over the past month, which is fine by me. I'm doing this mostly for myself, and I cover a very specific topic, so I don't expect huge growth or popularity. I'm just glad people find use in my site. The people who use my site tend to live in North America, more specifically in the northeast portion of the continent, which should be no surprise. Nobody from Greenland or Alaska looked at my site last month - what a pity! Judging by ad clicks, the most popular section of my site is the videos (27%), with the NB Southern section a distant second (17%) and the CN, New Brunswick East Coast and general New Brunswick sections about tied for third (around 8% each). I intend to go through my web site and embed some YouTube versions of videos into the basic web pages to provide not only pictures but videos of each unit, if possible. I want to script that so I don't have to go back and update the page itself when I add a video. Similarly, I want to replace the pictures in my web site with references to my photo gallery so people can download higher resolution photos if they are available. Do you have any thoughts on how I can improve the site for you? Simon Belanger has uploaded an interesting video of a few NBEC/CFMG trains... from Microsoft Train Simulator. Very nice modeling, if you ask me. While I was shoveling dirt on Sunday (June 10), Kevin G was shooting video in the Moncton-Amherst area and putting them on YouTube. Who was having more fun? Here is VIA 15 with 6409 and 6424 arriving at Amherst. Kevin got CN/WC 6941 working at Gort while waiting for VIA 15. And VIA 15 at Gort on its way out of Moncton. Dave has put his photos on NERails - follow this link to see them. He found a few very interesting locations to shoot from. I found the one to the right especially interesting. It's a very tight shot but it works for this short train. I decided to take the kids to go see the afternoon NB Southern excursion train on Saturday. 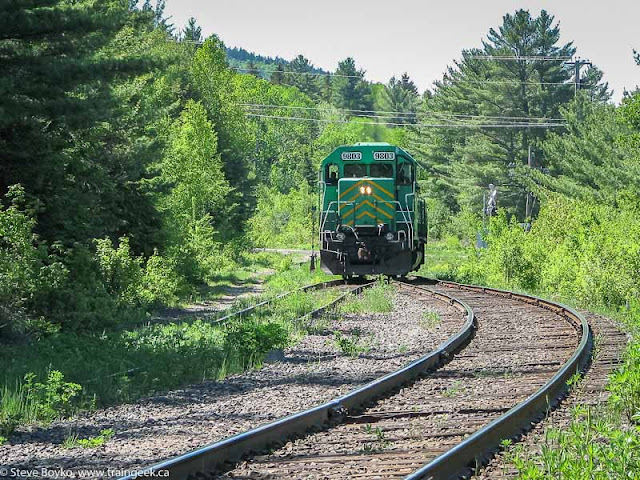 I had hoped that they would meet the eastbound freight at Welsford, but a quick call told me that they left Brownville Junction at around 11 AM and would not be meeting the passenger train. Too bad. The train was scheduled to leave at 2 PM, and I was well past Grand Bay on the South Bay Road by then. At 14:15 I decided to set up at mile 6 to wait for them, figuring they should be along any time. After about 10 minutes, Dave Dineen came along and we waited together. I heard on the scanner that they were passing NBSR 3703 in the yard at about 14:25 so it was obvious they were late. They showed up at 14:39. We chased them from there, but we were stuck behind a very slow yellow car and did not catch up to them for quite a while. They passed under us at the overpass by the Co-Op in Grand Bay, and we finally started (slowly) catching up to them through Grand Bay. Another slow vehicle kept us from getting ahead of them until we had left Grand Bay. I chose to get them at Westfield Beach, at 14:57. Right after they passed the siding, they slowed right down. It became clear that there was a slow order between mile 14 (Westfield Beach) and mile 17. Too bad for the passengers, good for us! I think it was a 10 MPH slow order so it was no problem at all to keep leapfrogging the train. Here they are at 15:03 just past the Westfield Beach overpass. And again at 15:08 at Sagwa? A little farther down the line at 15:12. Notice the railfan on the side of the road filming the train. I didn't recognize this person. I always wanted to shoot a train on the bridge at mile 17. This was my chance! They opened it right up after that and I barely beat them to the LaFarge road crossing. I slapped the tripod up, turned the camera on, and just managed to catch this at 15:19. I taped them at the highway 7 crossing at 15:23, then went to the west end of the siding to see 9803 run around the train. They had to stop to line the switches, go through derails, etc. so it is a bit time-consuming to do the runaround. They went back across highway 7 at 15:50. Here they are at 16:04. I shot them at 16:06, taped them at 16:08 and shot them again at 16:10. Thank you, slow order! For my final shot, I decided to try shooting them at Westfield Beach from across the Nerepis River. I crossed the river beside the old CN line and set up at the little trail shack on the other side. They showed up at 16:20. The shot was a little hazy and they were behind the MOW equipment in the siding, but hey, it was worth a try. After all that excitement, I thought I might have a chance to get the eastbound freight too. We proceeded up the back way through Wirral, Hoyt and so forth. As I approached the lumber yard outside Fredericton Junction, I saw boxcars going the other way at 17:00. I turned around but they got to the highway crossing before I did. I caught up to them by the Hoyt Station Road and I decided to try to get them at Enniskillen. 244 axles, according to the Hoyt hotbox detector. We gave up after that, and headed for home through Fredericton Junction. Another video found on YouTube - this one of VIA 15 at Gloucester Junction outside Bathurst with VIA 6400 leading. Nice work. With a lot of persistence, I finally got two more photos into Railpictures.net. Ron Grant was on the "promo train" before it first started carrying passengers and has some photos online. I wanted to take a minute to talk about the "other" Acadian Railway, the tourist operation that ran in 2002 and 2003. The railway operated up to ten Budd cars between Montreal and Saint John, on daylight-only trips on the "Acadian". Passengers stayed overnight at hotels in Greenville, Maine. Sharon McDonnell chronicled her trip in TravelLady Magazine. The first Acadian train ran on June 11, 2002. They had another train, the "Lake Champlain", between Montreal and New York City. If I recall these were private cars tacked on to the end of Amtrak trains but I may be wrong. Anyone know more details? They featured numerous trip packages that included side trips to Maritime tourist attractions, and linked up with tour buses and VIA Rail. On June 5, 2003, the Acadian Railway stopped operating excursions. They informed the Canadian Transportation Agency on July 14 that they no longer had insurance, and in order number 2003-R-494 their certificate of fitness was revoked. The president, Randy Parten, cited numerous reasons for the termination (such as a depressed economy, SARS, and mad cow disease, of all things) but the reality was that ridership was low. There were some discussions about resuming operations in 2004 but that did not happen. I regret very much that I never saw the train, even once. My good friend David Morris has photos of every run so I hope I can present a few photos from him. In the interim, have a look at these photos. The photo above is from the same site. Bill Linley featured an article on the railway in the July 2002 Transport 2000 Atlantic newsletter. By the way, do not go to acadianrailway.com unless you want unwanted software installed on your computer. The domain name has been taken over and is being abused. I've been travelling to a plant outside Saint John the past couple of days, but I haven't seen any trains. Today, though, I saw train-like things, if that counts. I heard a lot of MOW chatter as I was driving home, so I took the Grand Bay road home. I stopped to take a new photo of the caboose in Grand Bay. As I turned away from the caboose, a blonde leaned out of a passing car and yelled, "... nice caboose!" I'm pretty sure she was saying "you have a nice caboose" but I could be wrong. I heard foreman S.P. talking with the RTC, who said the eastbound left McAdam at 13:40. I was pretty excited, since it was 15:00 when I heard that, so the eastbound should be coming through Welsford any time, right? Right? I quickly realized that the NB Southern RTC always talks in Eastern time, not Atlantic, so the times he mentions are an hour behind. Why? I don't know. Anyway, it turns out there was quite a MOW crew in the siding at Westfield Beach. The new Nordco machine was there. What the heck does this thing do? By the way, I created a new photo album for NB Southern maintenance-of-way equipment. I didn't have time to hang around to wait for the eastbound, so I headed home without seeing a train. Pity - it was a lovely day for photographs. They depart from Harbour Station in Saint John and go to Welsford and back. I just called and they are completely sold out. Good for them! I'm told NBSR 2317 is just about finished being repainted into NBSR green at the Island Yard shops. NBSR 2610 is being prepared in the Dever Road shops for its turn. Once both of those units are done, every NBSR unit will be green. If you have a minute, please consider signing the Save the Kentville Roundhouse petition. There is some development planned for downtown Kentville, and the town council has approved the demolition of the old Canadian Pacific roundhouse, the last roundhouse in Nova Scotia. This structure should be preserved as an example of the rich railway history of the Maritimes. Please provide your address when you sign. It will not be displayed but it will provide an indication of where people are from, and add credibility to the petition. UPM-Kymmene has announced it will close the Miramichi mill in August 2007 for 9-12 months, citing weak demand and the strength of the Canadian dollar as factors. This will be a huge blow to the economy of the Miramichi area (and beyond) and will definitely affect the New Brunswick East Coast Railway's operations in the area. UPM is their main customer in Miramichi and no doubt there will be layoffs on the NBEC as a result of this. This is not a permanent closure (yet) but it looks grim. Coming on the heels of the announcement that Weyerhauser's facility will remain closed, things are looking bad for Miramichi. Planning continues on the Acadian Railway project. I received an update yesterday and I'll pass along what I can. Route selection is still ongoing. Initially a rail barge was planned to Lameque but this has been replaced by an intermodal transfer facility. Chances are the route could change again before it is finalized this summer. Route selection is a tricky business. You have to try to connect to the most shippers possible, while minimizing cost and doing the least damage to the environment. As I mentioned the planners are looking at EPA Tier 2 locomotives to achieve good fuel efficiency and minimize the effect on the environment. I'm not sure what else I can pass on yet but I'll try to keep you posted. This photo was taken on June 28, 1980 by Art Clowes. Now this photo was taken on July 6, 1994 and is the building that is still by Harbour Station (although it is not a VIA station). The question is: is the first photo the same building as the second one?